Every month, CoroCoro magazine is released in Japan, and always features various details and announcements about various kids or family-focused franchises like Pokémon, Yo-kai Watch, and The Snack World. And every month, the juiciest details from that magazine always end up leaking in the week leading to the release of the latest issue, and the February issue (releasing on January 15th) is no exception! And while there doesn’t seem to be anything really exciting about Pokémon and Yo-kai Watch games in this issue, there certainly is for The Snack World, the latest cross-media project from Level-5. Indeed, the latest issue of CoroCoro magazine reveals that The Snack World: Trejarers (the Nintendo 3DS game, originally released in August last year) is headed to the Nintendo Switch. Unfortunately, that’s all we know about this game for now: is it a straight port? Is there any additional content? When will it be released? We should have the answer to all those questions, and more, next week (most likely on Monday), when the game is officially announced. 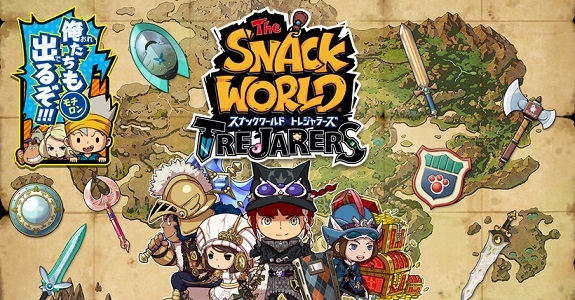 In a recent interview, Akihiro Hino explained that Level-5 would focus on the Nintendo Switch this year, and it looks like The Snack World: Trejarers is the first game to be announced. That makes it the second Level-5 game on Nintendo’s hybrid console, as Inazuma Eleven Ares was already confirmed a few months ago. More details about The Snack World: Trejarers will be available pretty soon. This post will be updated with additional details (or a new one will be posted) as soon as they’re available. The Snack World: Trejarers (Switch) does not have release date yet, but it’s already been added to the Upcoming Games page!